For 17 years, Abraham Lincoln, the 16th president of the United States, called this simple comfortable house at the corner of 8th and Jackson Streets home, from the time he purchased it in 1844 until he left Springfield in 1861 to face the ordeals of secession and civil war in Washington, DC. The only house he ever owned, it saw his transformation from a small town lawyer to a figure of national importance, and witnessed some of the most important events in his life prior to his inauguration as president. Lincoln came to Illinois with his family in 1830. He moved to New Salem a year later, pursuing various attempts as a merchant, beginning his legal studies in earnest, and involving himself in local politics. In 1832, he ran unsuccessfully for the State legislature as a Whig. He was more successful two years later winning the seat he held until 1841. By March 1837, he gained admission to the Illinois Bar and soon moved to Springfield, with all his possessions in two saddlebags. Springfield became the Illinois State capital in 1839, and Lincoln’s career as a legislator and attorney prospered. In 1842, the year he left the legislature, he began to court socially prominent Mary Todd. Her family opposed the young couple's match until the day of their wedding, November 4, 1842. For the first year and half, the newlyweds lived in rented rooms, where their first son Robert Todd was born. In 1844, Lincoln purchased the only home he ever owned for $1,500. Built in 1839, the house was originally a one-story cottage with two attic rooms. Here Mrs. Lincoln gave birth to three more sons, Edward, William, and Thomas. Edward died in the back parlor in 1850; Robert Todd Lincoln was the only son who lived to adulthood. Between 1846 and 1855, Lincoln enlarged the house to 12 rooms and two full stories. Retired from the State legislature and with a thriving law practice, Lincoln achieved his first major political triumph when he won election to the United States House of Representatives in 1846. By the time he returned to Springfield the following October, between sessions of Congress, he had already decided not to make a bid for reelection. At the end of his term in the spring of 1849, discouraged with politics, he came back to Springfield and turned his attention to the law. In 1854, the passage of the Kansas-Nebraska Act, which reopened the whole divisive question of the expansion of slavery into the territories, brought Lincoln back into the political forum. In 1855, he ran unsuccessfully for the United States Senate as a Whig. His decision to join the newly formed Republican Party in 1856 marked a turning point in his career. Lincoln rapidly rose to a position of leadership in the party. In 1858, the Illinois Republicans named him their candidate for the United States Senate, running against Stephen A. Douglas, the author of the Kansas-Nebraska Act. Lincoln’s acceptance speech, with its ringing prediction that “a house divided cannot stand,” set the tone of the campaign. 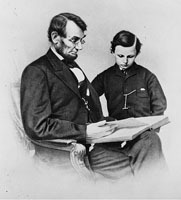 Lincoln’s logic, moral fervor, elegant language, and skillful debating techniques gained him national attention. Douglas won the election, but Lincoln’s status as a Westerner, an eloquent speaker, a skilled debater, and a moderate anti-slavery man won him the Republican nomination for president in 1860. On May 17, 1860, Lincoln received a committee from the Republican Nominating Convention in the parlor of his house. They informed him of his nomination as the party's presidential candidate. He conducted the campaign from his residence. He entertained numerous visitors, but left the majority of traveling, speechmaking, and writing to others. Running against three opponents, he received a clear majority of the electoral votes, but only about 40 percent of the popular vote. Not a single Southern state voted for Lincoln, and within six weeks of his election, South Carolina seceded. On February 6, 1861, about 700 friends, neighbors, and well-wishers came to a grand reception in the home. At the train station on the morning of February 11, Lincoln bade an emotional farewell to Springfield and asked the support of his friends and neighbors in the coming crisis. It was the last time he would set eyes on Springfield. Lincoln’s assassination in 1865 caused a national outpouring of grief, and his home became the focus for mourners. Overcome with grief, Mary Todd Lincoln could not bear to return to the home she had shared with her husband. In 1882, her only surviving son, Robert Todd Lincoln, inherited the residence; he gave it to the State of Illinois as a public museum five years later. By the late 19th century, Lincoln's home became a popular scene for rallies, ceremonies, and celebrations. The National Park Service has restored the house to its 1860 appearance. The project touched every aspect of the home, from its foundations to the replacement lightning rods that replicate those Abraham Lincoln had installed to calm Mary's fear of lightning. When Lincoln and his family left for Washington in 1861, Lucian A. Tilton, president of the Great Western Railroad, leased the house. He also bought much of the furniture, which was subsequently lost in the Chicago Fire of 1871. Most of the furnishings now in the house are period pieces, though some were associated with Lincoln. The restored house provides insight into the life of Lincoln and his roles of husband, father, and politician. 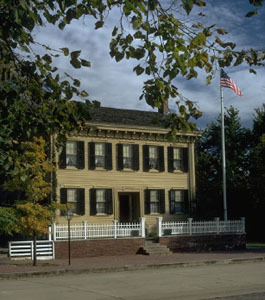 The Abraham Lincoln Home has been designated a National Historic Landmark and is a unit of the National Park System. Click here for the National Historic Landmark registration file: text and photos. Begin your visit at the Lincoln Home Visitor Center, located at 426 South Seventh St., Springfield, IL. It is open from 8:30am to 5pm daily except New Years Day, Thanksgiving, and Christmas Day. The only entry into the Lincoln Home is by a guided tour for a specific time. See the ranger at the Visitor Center desk to obtain a free ticket for a guided tour. School groups, charter tours, or other large groups must reserve Lincoln Home tours in advance by contacting the Springfield Convention and Visitors Bureau at 1-800-545-7300 or visit the website. For more information, visit the National Park Service Lincoln Home National Historic Site website or call 217-492-4241. In addition to visitor information, the website provides extensive essays, family accounts, photographs, and quotes from Lincoln and his family. The Lincoln Home National Historic Site includes the four blocks surrounding the house. The National Park Service is restoring this neighborhood so it will appear much as Lincoln would have remembered it. A number of historic buildings in the area related to the Lincoln era are open to the public. The Ninian W. Edwards House, a privately owned reconstruction of the dwelling where Lincoln courted and married Mary Todd, stands on the southeastern corner of Eighth St. and Capitol Ave. A museum, it contains historical exhibits, period costumes, and a series of dioramas depicting events in Lincoln's life. Another privately owned museum containing similar exhibits, the Abraham Lincoln Museum, is in a 19th-century building across the street from the Lincoln home. The First Presbyterian Church, on the northwestern corner of Seventh Street and Capitol Avenue, preserves a pew once used by the Lincoln family in a church that no longer exists. The Lincoln Tomb, in Oak Ridge Cemetery is about 4 miles northwest of the Lincoln Home. 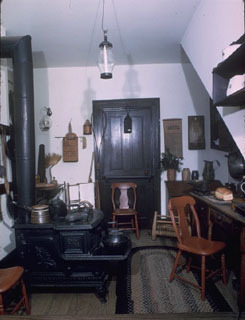 The Lincoln Home is the subject of an online lesson plan, Lincoln Home National Historic Site: A Place of Growth and Memory. The lesson plan has been produced by the National Park Service’s Teaching with Historic Places program, which offers a series of online classroom-ready lesson plans on registered historic places. To learn more, visit the Teaching with Historic Places home page. The Lincoln Home and several other buildings in the historic district have been documented by the National Park Service’s Historic American Buildings Survey (search for Lincoln Home). Visit the National Park Service Virtual Museum Exhibit on the Lincoln Home National Historic Site.